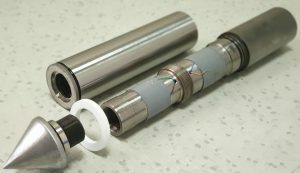 The Digital Piezo Static Cone Penetrometer (PCPT) is a rugged and compact system; the analogue to digital conversion is performed down hole, with each cone possessing its own memory and identity that is automatically recognised when connected to the logging system. This is a compression cone, meaning the tip resistance and sleeve friction load cells are decoupled and measure independently; this ensures that the readings from the cone are more accurate than other cones. Accurate temperature compensation assures reliable performance in soft soils and also in a situation where there is a considerable difference between air temperature and ground temperature. The Gamma Cone measures variations in naturally occurring gamma radiation. The gamma sensor is mounted behind a standard CPT cone allowing us to obtain standard geotechnical data as well as gamma radiation simultaneously. This probe is commonly used for chalk solution feature investigations. It can be hard to tell the difference between clay infill material and highly weathered chalk due to its similar properties when the cone is pushed through. 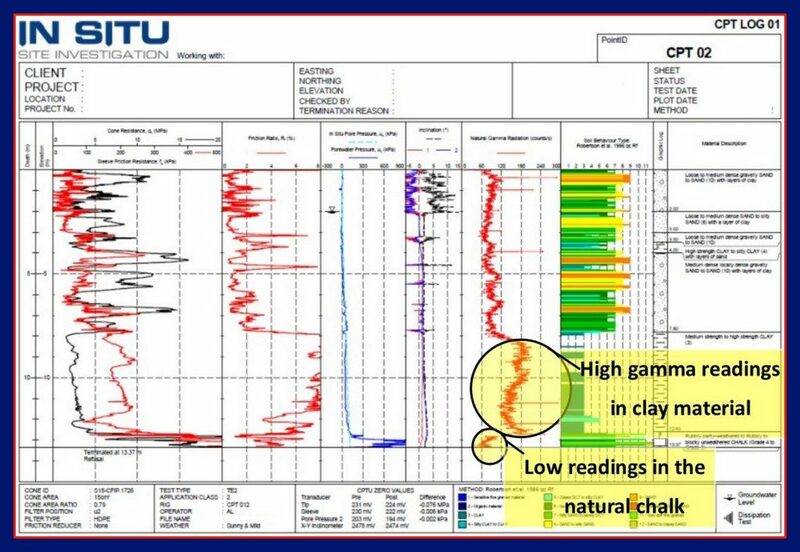 By using the gamma cone, we would obtain high gamma readings in the clay material due to the presence of elements such as potassium and very low readings in the chalk. Using this probe in conjunction with other parameters such as pore pressure allows us to accurately determine the chalk interface. The Video Cone Penetrometer has a miniature colour video camera, an LED light source, micro-optic components, and a durable scratch-resistance sapphire window integrated into a Digital Piezo Static Cone Penetrometer (PCPT) cone housing. 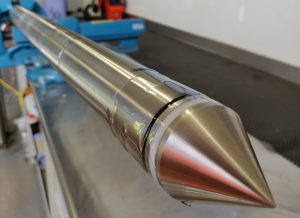 This single cone will provide standard geotechnical measurements, such as tip resistance and sleeve friction, as well a high-resolution view of the soil in real time. The video image is displayed on a portable display screen and recorded digitally onto a DVD or hard disk. A text inserter module allows the video of the test to be stamped with the depth as it increases as well as the test identification number. Post processing provides a picture log which is imposed next to the PCPT log, helping with the correlation of the soil type. The Video Cone is a useful tool in both Contamination Detection and Soil Classification. For environmental work, the Video Cone allows the visual detection or confirmation of the presence of non-aqueous phase liquid contaminants in the soil, such as creosote, tar and gasoline. For Geotechnical work, the Video Cone shows soil texture, grain size, colour and other soil features. The volumetric percentage of water in soil (Soil Moisture) has become an important consideration in geotechnical and environmental design and is one of the most fundamental factors in influencing soil strength. The Soil Moisture Cone (SMC), provides real-time in-situ data logs of soil moisture and resistivity without sampling; also measuring the standard geotechnical parameters from the attached Piezocone. The SMC takes advantage of the relationship between the soil dielectric constant and moisture, known as Topp’s Equation. This relationship is not strongly influenced by soil type and resistivity if the dielectric measurement is made above a critical frequency of approximately 30MHz. The inner two electrode rings of the cone determine the soil’s moisture content by measuring the frequency shift of a high frequency excitation signal as it passes through the soil near the surface of the module. The outer two rings of the four electrodes are used to measure resistivity. An AC voltage signal of constant amplitude is applied across the rings. A voltage measurement, which is proportional to the current through the soil, is made across the sampling resistor. The Intrusive Magnetometer System is used to survey for UXB (unexploded bombs) across a range of environments including, Rivers (and Riverbanks), Land, Harbours, Railways, Tidal and Near Shore Marine. The probe is highly sensitive three-component Fluxgate Magnetometer System which can be deployed from a variety of platforms. The system has high detection capabilities, which in most environments has the ability to detect a 50kg WWII bomb at 2 metres from the probe. Surveys can be conducted to the maximum bomb penetration depth with high survey productivity rate. The Computerised Intrusive Magnetometer Survey allows for the real time control of survey data with excellent data quality and is CAD compatible.